Heartburn is a typical burning sensation in the chest that causes extreme discomfort to the person. Though the causes of heartburn vary, a tentative idea suggests that certain kinds of foods can also trigger heartburn. This problem can therefore be prevented or controlled by understanding the type of foods that might trigger heartburn. Heartburn can be the result of several causes. However, the most common cause of heartburn is GERD or acid reflux. Many people suffering from acid reflux experience heartburn as one of the many symptoms that this disease produces. The burning sensation is the result of the gastric juices in the stomach going back of refluxing to the esophagus. This movement causes a burning sensation in the chest along with significant amount of pain. The main reason why many believe that there is a link between heartburn and food is that, heartburn takes place typically after a meal and especially at night after a heavy meal. Typically, food that might trigger heartburn includes fatty food, oily and greasy concoctions, meat, salty food, spicy food and even certain types of fruits and vegetables. Besides this, certain types of foods are also held responsible for triggering acid secretion including tomatoes, chocolate, peppermint and other types of citric fruits including lemon. We all experience significant distress after a large meal. This is especially true if this meal is fatty, oily and spicy. This is because; this type of meal is very difficult to digest, especially if it is not followed by some kind of physical activity. If you are suffering from GERD, you will get more than just stomach uneasiness. 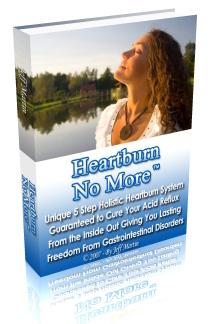 You will immediately get some or all the symptoms of GERD, including heartburn. There are several reasons why this type of food can trigger heartburns. 1) Evidence suggests that certain types of foods that might trigger heartburn do so, by weakening the LES or lower esophageal sphincter, which is located at the bottom of the esophagus. The LES is mainly responsible for preventing the acid to flow back in the esophagus by closing the closing the one-way valve from esophagus to stomach. 2) Sometimes, more than what you eat, how much you eat also matters. Many people experience heartburn after a particularly large meal. Hence, mostly people experience heartburn after attending a scrumptious party or a lavish wedding. This happens, as it is difficult to difficult to digest a big meal, which is especially rich in nature. 3) Limited water intake after having a meal cal also increase or trigger heartburn. People usually substitute water with a glass of soda and even worse with alcohol. Therefore, if you don't drink water after consuming food that might trigger heartburn, you are heading for big trouble. Water flushes off toxins and eases digestion. Hence, water intake should be increased to prevent heartburn relapse. There are many other types of foods that might trigger heartburn. However, they tell only half the story. To understand the problem and to seek a solution, you can consult a holistic treatment practitioner to help you have a sound diet plan to control heartburn and prevent its reoccurrence in the future.